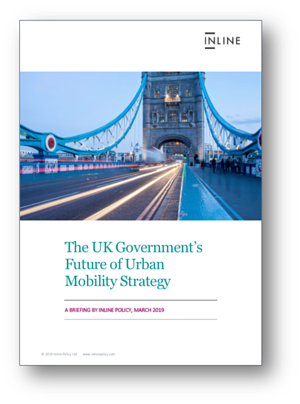 The publication of the UK Government’s Urban Mobility Strategy heralds significant regulatory changes that will have an impact across the mobility sector. Here we provide the headlines and you can download our full briefing. What is the Urban Mobility Strategy? The Strategy is a part of the Government’s Industrial Strategy – its plan to tackle long-term challenges facing the UK economy. It sets out the Government’s intended next steps, both in the short and the long term, to ensure that the UK can facilitate innovation in the urban mobility space, whilst keeping an eye on other goals, including inclusivity, the transition to zero emissions transport, reducing congestion and increasing active travel. What is in the Strategy? The Government will launch a consultation on “micromobility” (bikes, e-scooters etc.) and may introduce a Code of Practice for operators of shared mobility. The consultation will pave the way for deregulation allowing e-scooters to operate and will set the terms for the regulatory framework within which they operate. The Government will provide funding for four “future mobility zones” to test out new forms of mobility. The West Midlands Combined Authority has already claimed £20 million of this with a proposed scheme to incentivise people to give up their private car in favour of shared or public transport. The Government may seek to use regulation or other incentives to encourage or require transport companies to share their data. The Government sees this as an important driver for Mobility-as-a-Service and a way to foster innovation and competition. Mobility as a Service and on-demand buses are also set to feature as part of a “regulatory review”, whilst commitments previously made regarding electric cars have been reiterated. This is the most comprehensive review of transport policy in a long time. Entire new sectors could be opened up, including e-scooters, which despite their success in other European cities have remained effectively illegal in the UK. Cities will begin to trial new services with Government funding. Rules around the sharing of data could be altered, whilst competition rules will be monitored to ensure that a small number of operators do not achieve too powerful a market position in the field of Mobility-as-a-Service. The process will not happen overnight. The strategy is designed to start a conversation rather than to define the terms of mobility regulation, the specifics of which are very much still up for debate. With that in mind, businesses in the sector should think about how they want to approach this strategy and in particular how they wish to engage with Government on the issues that will make a difference to how they operate and develop in the future. The forthcoming regulatory review offers a chance to engage with policymakers and ensure that the concerns of businesses are being listened to. Inline Policy has produced a briefing on the Strategy which you can download here. We help businesses in the tech sector to understand and influence policy, and we are experts in the urban mobility space. If you have any questions about this strategy please do not hesitate to get in touch. You can also sign up for updates on mobility policy below.